The configure section (figure 1) is where you can define how various aspects of Contactsend should function in day-to-day use. Enables you to manage the database/s that contain the group contact (user) data. Users that manage more than one group can have one database for each, or just one database with different filters. The link to the database from which the contact (user) data is to be taken for a campaign. The sender details (mail from). Any predefined settings, such as the message subject, attachments, the delivery type and similar. The generation of group subscription/unsubscribe forms, for insertion into your website. Enables you to configure one or more mobile applications. Enables you to manage systems that are integrated with Contactsend. 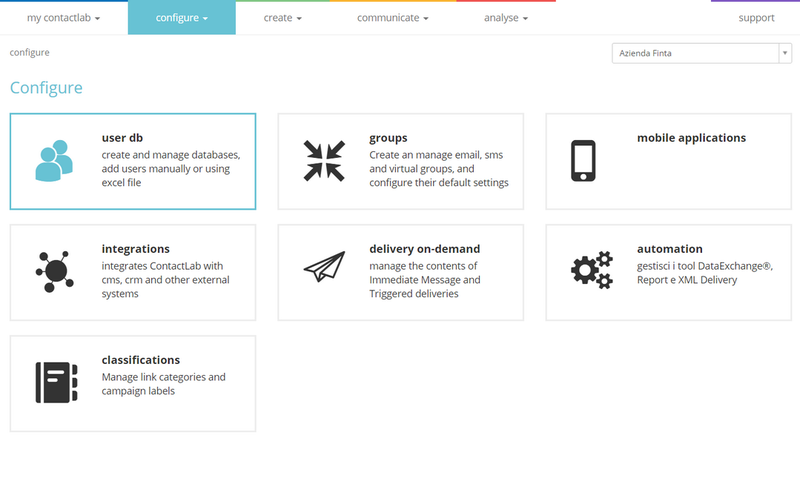 Enables you to manage and change triggered delivery and immediate message content. Enables you to manage DataExchange and XMLDelivery tools, as well as reports and seed lists. Enables you to manage theme-based categories for links and campaign labels. Depending upon the permissions that are assigned to your account, some of the above functionality may be limited, or the group creation path may be different.